NEW YORK, NY / ACCESSWIRE / April 15, 2017 / Most people ride escalators without giving much thought to safety. Compared to elevators, the "moving stairs" of escalators tend to seem relatively benign. A video of the incident posted online by People magazine shows the packed escalator suddenly slamming into reverse, then speeding up, sending terrified shoppers tumbling into each other. According to one woman who was riding the escalator during the accident, it sped up "two times faster than normal." The footage, which is dramatic and terrifying, shows just how deadly and dangerous escalators can be. The People report says that the escalator involved in the Hong Kong accident is maintained by the Otis Elevator Company, the world's largest manufacturer of elevators, escalators, and moving walkways. New York City personal injury lawyer Jonathan C. Reiter states, "What's interesting about the American Association for Justice's report is that it highlights how the escalator manufacturing industry has worked hard to influence public perception about what causes escalator injuries. Escalator manufacturers would like everyone to believe that horseplay and rider carelessness cause the majority of escalator injuries and deaths. In reality, most escalator injuries and deaths are caused by unsafe designs or poor maintenance." 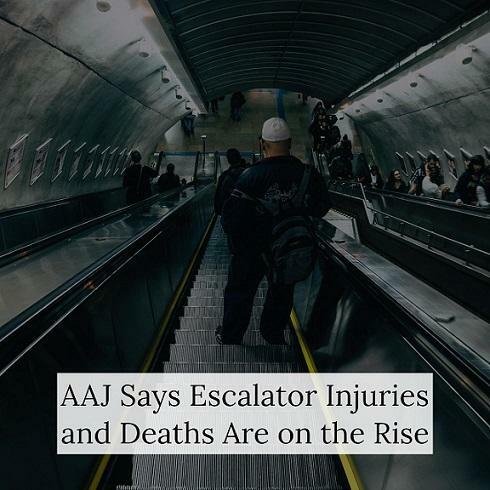 According to the AAJ, documentation has been unearthed in several escalator injury cases showing that escalator manufacturers are aware of safety issues, as well as what typically causes escalator accidents. If you or a loved one has been injured on an escalator, don't assume that your case is a lost cause, or that you'll never be able to prove what caused your fall, entrapment injury, or other type of accident. Talk to a New York City personal injury lawyer as soon as possible to discuss your case.